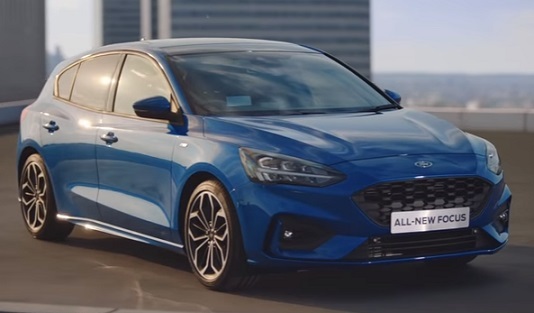 Ford invites people to experience “The Beauty of Change” with the All-New Focus, in a new TV advert, highlighting that this is a completely new car that has changed in every single way. The 60-second spot features thousands of blue and white butterflies flying across rivers, hills, and forests to a city where they form, on a building rooftop, the next generation car, whose exterior design has been sculpted to create a shape that’s “both athletic and aerodynamic,” according to the brand. The classical music serving as the soundtrack is called “Transformation” and is performed by British jazz and electronic music group The Cinematic Orchestra. The automaker states that the new Focus, inspired by “a new human-centric design philosophy with class-leading aerodynamics and a sophisticated range of Ford driver assistance and connectivity technologies,” has been “totally transformed to take you further than ever before”. The All-New Focus, available with a range of powerful and highly fuel-efficient engines, all complemented by 8-speed automatic or 6-speed manual transmissions, boasts an interior described as “more comfortable, spacious and chic than ever before.” With generous head, leg and elbow room at the front and back, with rear seats that split 60/40 and can fold almost completely flat, and an adjustable load floor in the boot, the space won’t be a problem with the all-new Ford Focus. The impressive set of Driver Assist Technologies includes Adaptive Cruise Control with Stop and Go and Lane Centring, and Active Park Assist 2. The All-New Ford Focus range includes Ford Focus Style (starting from £17,930), the Ford Focus Zetec (starting from £19,300), the Ford Focus ST-Line (starting from £21,550), Ford Focus ST-Line X (starting from £24,050), Ford Focus Titanium (starting from £21,550), Ford Focus Titanium X (starting from £22,800), and Ford Focus Vignale (starting from £25,450).